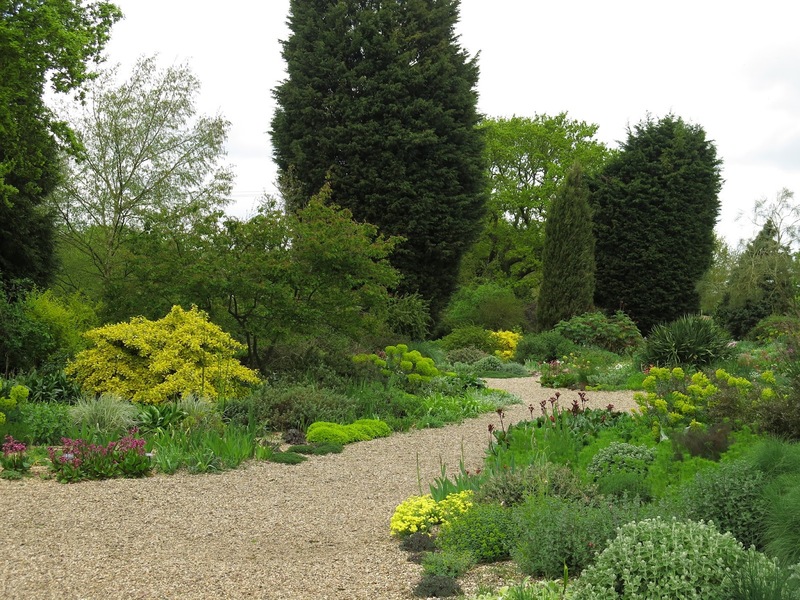 It occurred to me only recently that much as I love the Beth Chatto Gardens, I've only ever visited them in summer. 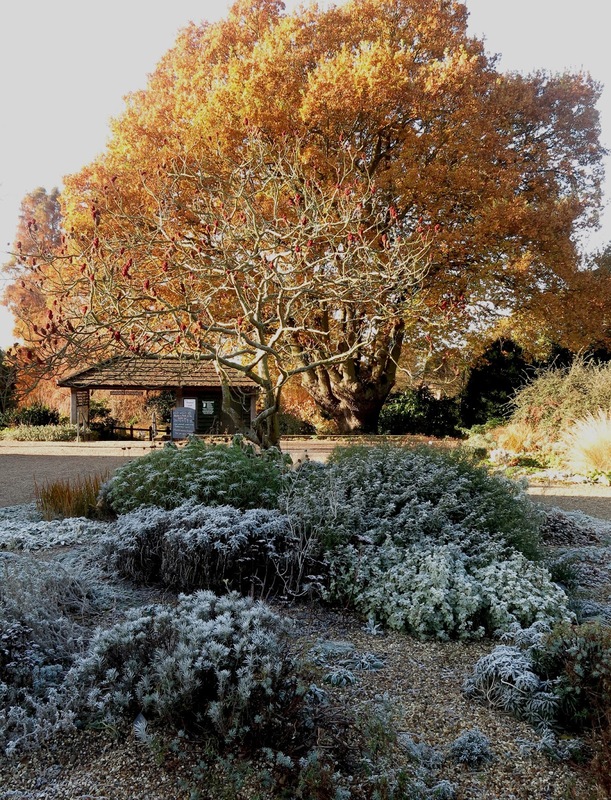 With the run of fine dry (and very cold) weather recently, it seemed too good an opportunity to miss to see the gardens in early winter splendour. 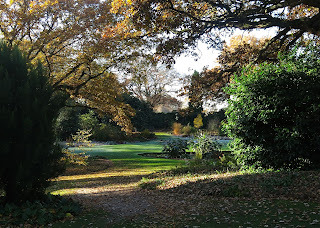 A bit late for the full glory of autumn foliage, but the gardens were still full of colour in the pale winter light. The oak tree which stands near the entrance to the gravel garden was still in fine golden leaf on this frosty morning. 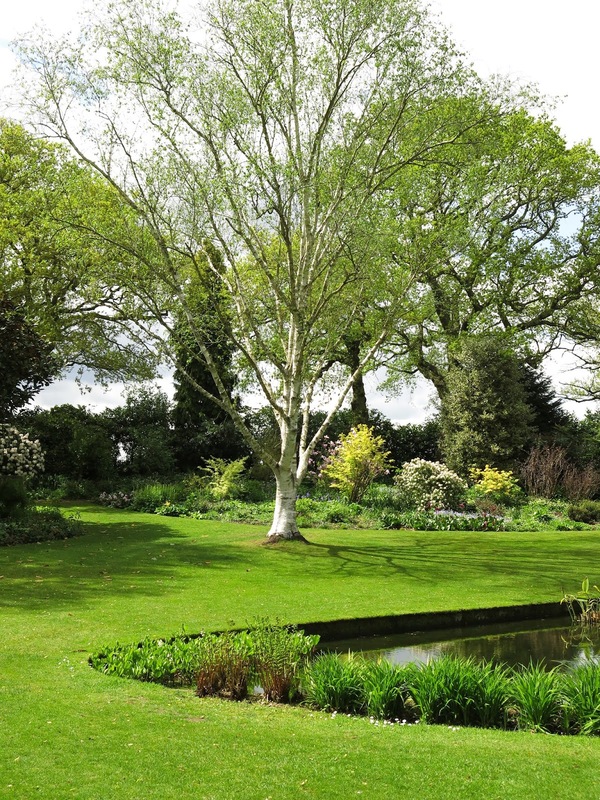 The picture right, shows the same view in late May. 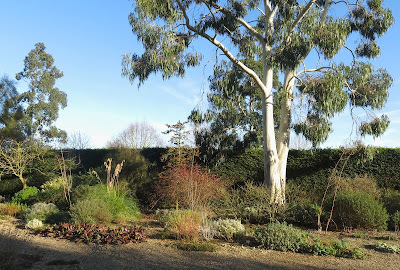 The eucalyptus trunk shines white above the greens and bronzes in the gravel garden. This garden thrives without irrigation and for much of the year is a harmonious mix of green, gold and silver foliage, and flowers in many colours though purple and golden yellow always stand out. The gravel garden amply demonstrates that a beautiful garden can be created from unpromising pieces of land: this was carved out of the original car park. 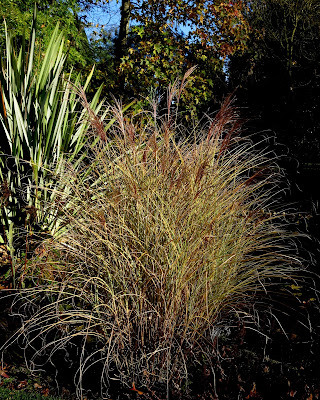 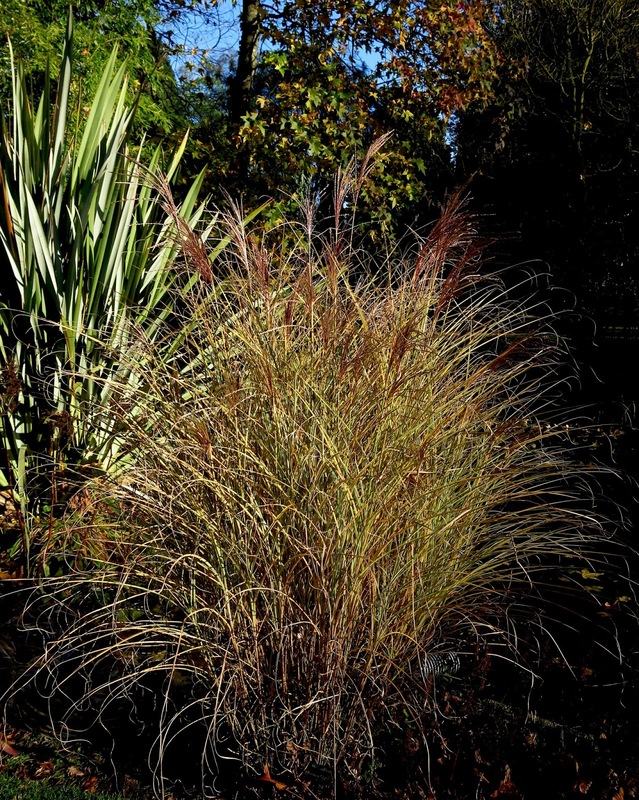 The grasses still look fabulous, above, creating a veil-like backdrop for seedheads in the reservoir garden, and below, Miscanthus sinensis 'Morning Light' glowing bronze in the, er, morning light. 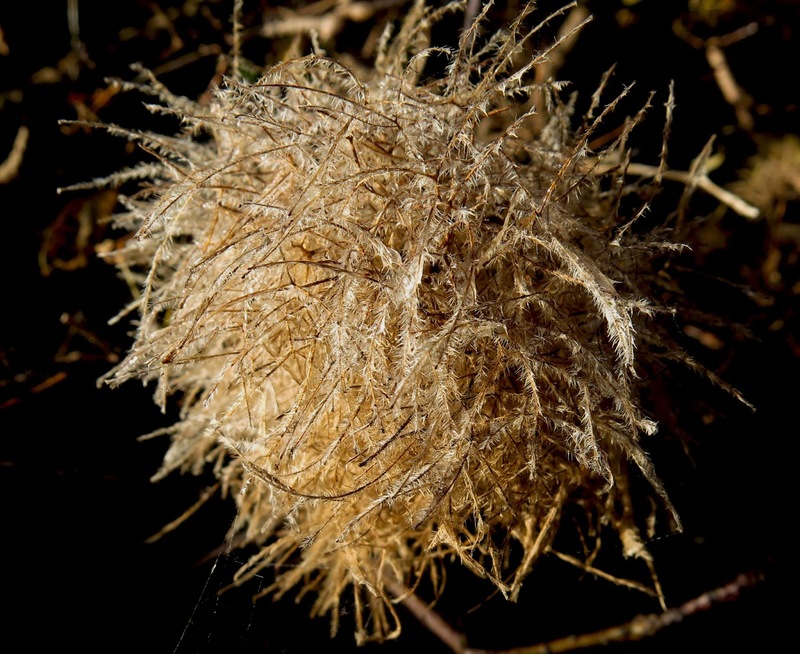 Fine filaments like feathers on Cotinus coggygria on the edge of the gravel garden, and also below. Flowers and fruits on Euonymus europaeus 'Red Cascade' (spindle tree), lighting up the woodland garden, above. The Taxodium distichum (swamp cypress) and Liquidambar with its multi-coloured autumn foliage, blend here in this long shot to provide a dramatic backdrop in the water garden. 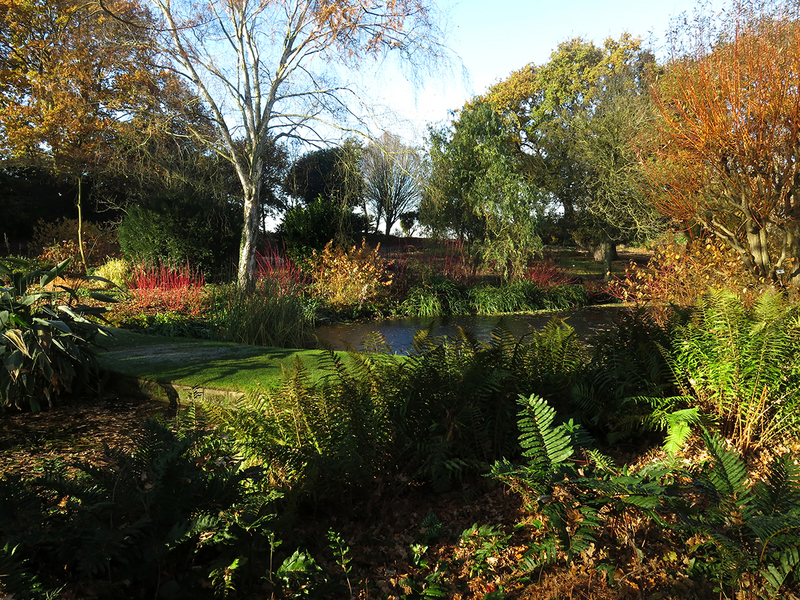 Surprisingly deep hues for this time of year in this view across the water, the colourful stems of Cornus showing up particularly strongly. 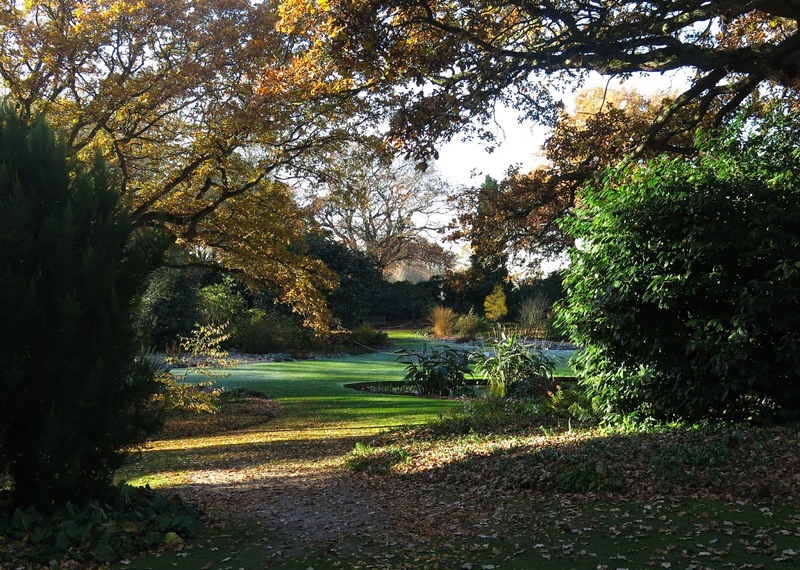 The pools in the Beth Chatto gardens are man-made, dug out from a stream running from a natural spring down to the reservoir on the edge of the gardens. 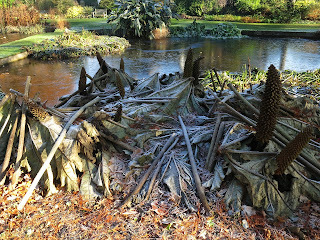 In spring and summer the ponds are fringed with the large leaves of swamp cabbage and Gunnera manicata, both of which have died back by the end of November. The tender crowns of Gunnera manicata need protection from winter frosts, so the leaves are cut and folded over the centre of the plants. 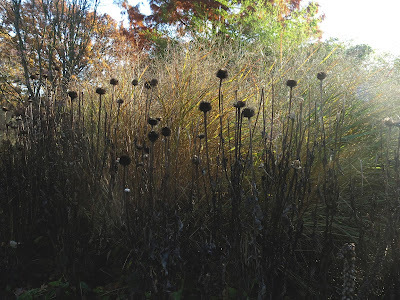 It's not pretty - the stems look as though they are wearing shabby raincoats - but it is effective. The view into the water garden, now sadly without the birch tree which stood like a figurehead at the foot of the ponds. 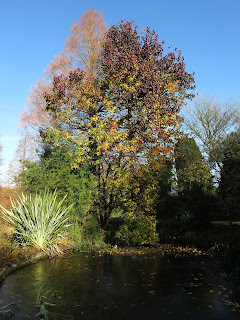 The tree, pictured below last year, was cut down as it had reached the end of its natural life. 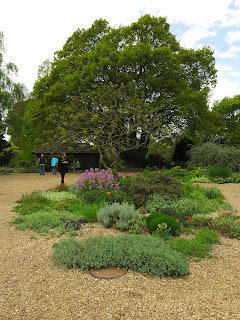 The Beth Chatto gardens definitely reward repeat visits. I love the lack of straight lines, the borders marked out in graceful curves, paths winding gently through the planting. I love the diversity of the planting, the gradation from the spiky silver leaved shrubs in the dry garden through the mixed borders and tranquility of water and then into the woods with their colourful carpet of bulbs in spring. 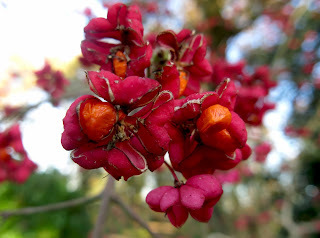 I love how plants are left to self-seed (within reason) so that the gardens develop organically over time. 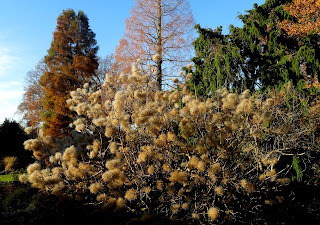 It's endlessly photogenic, a garden full of enchanting views, and yet its visual appeal seems effortless.